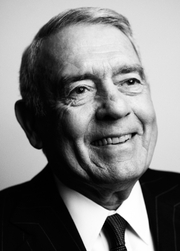 Dan Rather anchored the "CBS Evening News" from 1981-2005, and currently hosts "Dan Rather Reports" on HDNet. His new memoir, Rather Outspoken: My Life in the News, was recently published by Grand Central. You open the book with chapters on the Abu Ghraib prison scandal and on the controversy surrounding the story of George W. Bush's National Guard service record, the two events which you write were responsible for your departure from CBS News after forty-four years. If you had that period of your life to do over again (and I ask this knowing that you don't, of course), would you have done anything differently? What did you take away from those experiences that's proven useful for you in the years since? I don't have it to live over again and see no use in playing the "might have, could have, should have" game. I wrote what I witnessed, what I learned (at great expense) and I wrote my heart. Beyond that I just keep remembering my late mother's often stated mantra: "About yesterday no tears; about tomorrow no fears." And I just keep on keeping on. Always with the knowledge that I'm not perfect—I've made my mistakes, had my failures and have the scars to show for it. One of the major themes in "Rather Outspoken" are the major changes in American journalism in recent decades, most importantly the "corporatization, politicization, and trivialization" of the news. You write "Too often, the top priority for large media companies is not the news, but the imperative to protect the interests of their parent companies and their advertisers. Burying or soft-pedaling a story is simply censorship masquerading as good business." As I was reading I kept asking myself what we as individuals can do about these trends, other than just being aware of them and factoring them into our understanding of what is marketed to us as "news." Do you have any thoughts on this? Individuals can and should be aware—be very aware—of these trends, and the fact that they are increasing not decreasing. And they should factor them into their understanding or how much of the media—especially huge corporate media—really works. Individuals can work as part of our collective society to speak up, write up, in opposition to the reducing if not eliminating the plunge toward ever-larger control by ever-larger international conglomerates reducing competition and controlling more national distribution of news. Understanding just how much, how very much, big business is in bed with big government (whether that government is led by Democrats or Republicans at any given time) to benefit their mutual interests, not the public interest, is key. You're now working for HDNet on a weekly one-hour investigative program, "Dan Rather Reports." From the book it's pretty clear that you're enjoying this very much, and the show's been very successful so far. Do you see programs like yours as the future of investigative television journalism, given your concerns over the direction of the broadcast networks and other "news" outlets? It is clear that the old media order has broken down. And the gutting of newspaper staffs and television news divisions, with an increased reliance on entertainment content, has created a crisis in investigative journalism. I think that independent ventures HDNet can help fill some of the void. The editorial freedom Mark Cuban has given me is really unprecedented. The question is how many people out there have the means and interest to fund high-quality investigative reporting? In many ways I can't think of a more patriotic thing to do. You write in the book about the important role certain teachers played in your life. Tell us about those teachers and what key lessons they taught you that you've put to use in your life and career. One common thread for many of my teachers is that they believed in me and took the time to treat me as an individual. They taught me that it is not just about the destination but it is about the journey. However we try to reform our educational system, we must allow for teachers to see their students as individuals. I often say that those who live by the crystal ball learn to eat broken glass. I don't really know where this election will end up, other than it will almost certainly be close. As for twists and turns, I think that the only people really focusing on that now are an insular press corps and political activists. We're still in the early innings, but the game has definitely begun. The real question is what will all this money pouring into the process mean for whoever is elected. What's your own library like? What sorts of books would we find your your bookshelves? I have had a love for reading from when I was a young boy. I am often juggling a couple titles, probably read a bit more non-fiction than fiction. I like reading new releases, but I also like going back to old favorites. I have a copy of the Harvard Classics, an anthology of world literature that I often find myself re-reading. One book I just read was written by great young writer who has done some work with us at "Dan Rather Reports". It's called Visit Sunny Chernobyl, by Andrew Blackwell. It is a travelogue and musings about some of the world's most environmentally damaged places, but it is far from a polemic. Can you tell us about any projects you're working on now that we can look forward to viewing in the future? We have been working on an investigative series on education that will have some new installments in the fall. We will also be following the money for the presidential campaign.